A reconstruction of the weather conditions at a particular location during a given time frame. After we have conducted our research, one of our meteorologists will discuss our findings with the client and will be available for consultation to determine the next step in the case. The verbal briefing often leads to a written report. Data for preparation of the verbal report comes from all available sources of weather data. A written report, signed by three meteorologists presenting our opinion, to a reasonable degree of scientific certainty, as to the weather conditions at a particular place during a given time frame. Our report expresses our opinion of the weather conditions at the exact street address where the incident took place, as opposed to the nearest airport. The data used in preparation of a comprehensive site-specific report come from all available sources of weather data. This is the most detailed report available. Our weather experts have the experience and skills to explain complex weather conditions to a jury in a way that is easily understandable. We have participated in hundreds of trials across the country for both plaintiffs and defense. Video and audio conferencing is available. Sworn pre-trial testimony of our findings by one of the AccuWeather forensic meteorologists. A deposition can be done at the AccuWeather office or at a location of the client's choosing. Our experts combine a Ph.D. in meteorology and the Certified Consulting Meteorologist distinction to give you the best possible expert for your case. Video and audio conferencing is available. Graphs, tables, charts, maps, animations or other items requested by a client that are used in court in conjunction with testimony. These items are generally produced in house by the AccuWeather graphics department, whose graphics are used by hundreds of television stations and newspapers to explain the weather to the public each day. Hourly weather data from any official National Weather Service reporting station including any or all of the following: temperature, dew point, relative humidity, cloudcover, precipitation, snow depth, visibility, wind direction, and wind speed. These observations are decoded by a meteorologist and put into an easy-to-read chart. Each set of hourly surface weather observations is accompanied by a letter signed by one of our meteorologists explaining what the data show. Hourly surface weather observations are more detailed than any of the monthly products that are available. They are useful in many cases. These hourly observations are typically available for the airport nearest to the site in question and can cover a range of 24-hours or longer. A summary of the weather conditions during a month available from 1000+ United States official observation sites. The Local Climatological Data Monthy summary includes daily averages, totals, and extremes for temperature, precipitation and wind, and hourly precipitation totals. These Local Climatological Data Monthly summaries are examined by a meteorologist before being sent to a client. The local climatological data monthly summary is also a good first step for many cases. 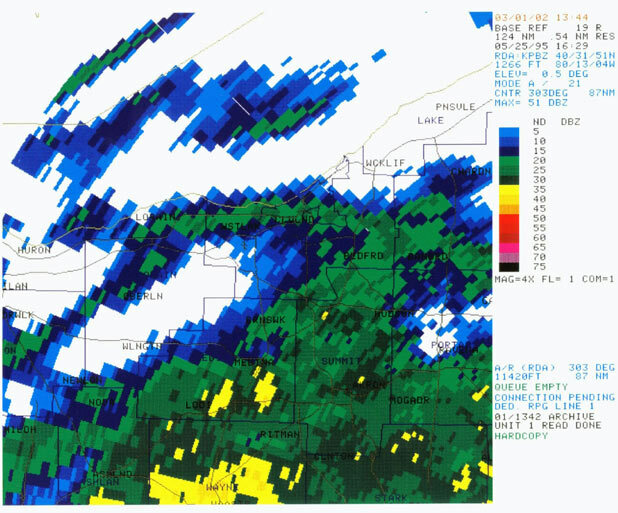 Doppler radar products include wind velocity, precipitation intensity, one-hour precipitation totals, and storm total precipitation. 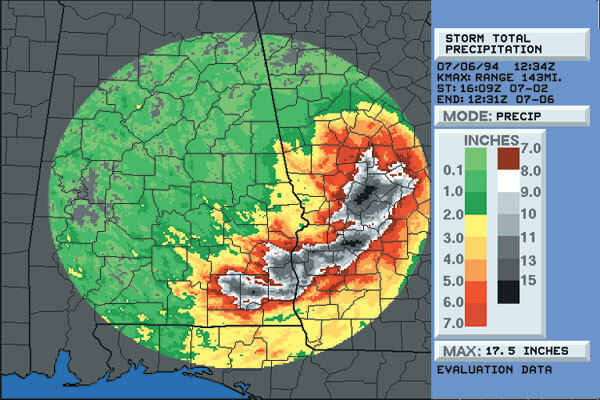 Our experts will not just provide you with a Doppler radar image. They will study the image and provide you with a letter explaining what we see in the image to help you better understand the benefits of the Doppler radar image. Doppler radar data are useful for cases involving lightning, wind damage, motor vehicle accidents, and excessive rain, just to name a few. Several cloud-to-ground lightning strike products are available. The most basic products are the United States, Pennsylvania, and vicinity maps showing the location of cloud-to-ground lightning strikes during a calendar day. Also available are three products that give information on lightning strikes within a given radius of a site during a specified time frame. The first just tells the number of strikes. The second is a map showing the location of the strikes. The third is a listing of the exact time and distances from the specified location of each strike. Each lightning strike product is interpreted by a meteorologist and is accompanied by a letter signed by a meteorologist explaining the data. Lightning strike data is often utilized to help insurance companies settle lightning damage claims.